The MSD624 Sentinel™ Series Dry Suit is the next generation MSD577 SR. Ideal for personal suit issue protocols, the MSD624 is a waterproof and breathable constant wear water rescue dry suit specifically designed for flood, swift water and ice rescue situations. By reducing bulk and increasing range of motion, the Sentinel™ Water Rescue Dry Suit meets the most demanding water rescue environments. Tested and validated by water rescue professionals, the Coast Guards and other military rescue operations, the Sentinel™ dry suits offer enhanced features that provide specific advantages critical to protecting the rescuer in severe and unpredictable environments. A must for land or ice based rescue teams. Wrap sling around object, or auger screw into ice. 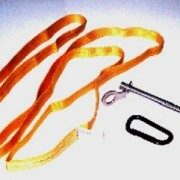 Non-locking carabiner connects rescue tether line to either anchor point.